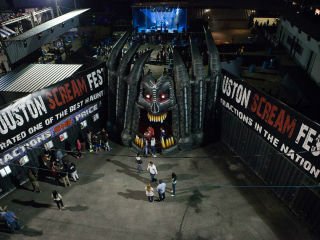 The Houston Scream Fest is more than a haunted house, it's a month-long festival. Guests can enjoy adult beverages and get the fright scared out of them at the haunted attraction. There will be live concerts each night, and guests can visit the midway and play carnival games or have some food from vendors. There will also be watch horror films on the big screen and guests can shoot at walking dead zombies.